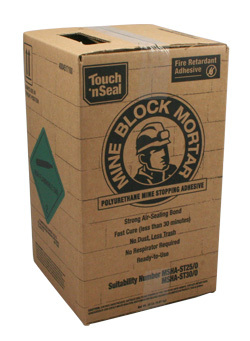 Mine Block Mortar is a superior, single component, polyurethane mine ventilation stopping adhesive. It quickly provides a strong air sealing bond between concrete blocks used in underground coal mine ventilation stoppings. Mine Block Mortar bonds standard block, replacing traditional mortar and strength-enhancing surface skim coating found in most underground coal mines. It can also be used in underground, non-gassy metal and non-metal mines. It is fire retardant and meets air quality standards when used according to manufacturer's recommendations. Mine Block Mortar can also be used to repair and seal mortar joints.